It was a perfect start for the premier league club Chelsea as Sarris's men had a victory over Huddersfield at the Kirkless Stadium. 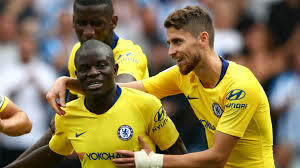 N'Golo Kante put's Chelsea ahead by scoring the first goal with William as the assist at the 34'th minutes Jorginho doubled Chelsea goal by scoring the second goal by penalty kick at 45'th minute's. Pedro sealed it for the blues with an 80'th minutes goal with assist from Eden Hazard. Sarri has made a good premier league career start at Chelsea by leading the blues with a 3:0 victory against Huddersfield at the Kirkless Stadium. I think Eden at this moment cannot play for 90 minute's. He has to improve by training. "I think the best thing for him is to play 15-20 minutes when the opponent are probably tired". It's a good start for the blues and also a good start for Tottenham as they beat Newcastle 2:1 at Newcastle's home, Crystal Palace as they beat Fulham 2:0 at Fulham's home, Bournemouth as they beat Cardiff 2:0 , Watford as they beat Brighton 2:0 at there home while Wolves had a 2:2 draw with Everton. Chelsea will meet Arsenal on there next game on Saturday 18'th of August.